I just finished James Bach’s “Secrets of a buccaneer-scholar” and it hit home in a weird way. I’m not an unschooler or a high school dropout, but I could still relate to a lot of things in his book. It was a tremendous read, giving me instant flashbacks to the days of yore. As a young kid, I constantly skimmed through encyclopedia volumes that were lying around the house. I wasn’t “studying” from them, I was just fascinated by what I thought was all the knowledge of the universe compiled into 14 volumes. I let my mind wander while looking at the pictures, jumping randomly from subject to subject. When something looked fascinating enough to stay with it for a while, I dove in and read through the whole entry. I didn’t understand all of it, but I didn’t really mind. Most of the time it was just superficial browsing anyway – I blamed it on my short attention span. But as I was doing it more frequently, it became more systematic. Once in a while, I came across things that I previously ignored, but all of a sudden did seem interesting enough to investigate. Things I had previously read helped me to understand new things as well. I learned that I remembered lots of information without trying to. It just sticked because it was so damn interesting. I did the same thing with all the world maps and globes I could get my hands on. They really got my imagination running. The result is that I’m still bursting with trivia that spill out on the most inconvenient moments. It’s great in the occasional quiz, though. I always thought that was a bit awkward. Not many kids I knew read encyclopedias and atlases in their spare time. It’s not that I didn’t enjoy school, but this kind of exploratory learning felt more natural to me. There was hardly any effort involved. It was pretty chaotic, but it was a learning style that fit me like a wet suit. As an adult, I am facing the same problems: I like to learn and educate myself, but in an almost impractical and inefficient way. I see interesting ideas and sources of knowledge everywhere, and this overwhelms me – so many things to learn, so little time! I purchase far more books than I can read (thanks for that, Paypal & Amazon). I start reading books but do not necessarily finish them. My reading isn’t very linear. I tend to get distracted often and feel the need to switch to something else. I procrastinate more than I would like. At this very moment, I’m trying to read nine books at the same time. I used to feel bad about all this inefficiency. Until I finished James Bach’s book, a couple of hours ago. It put things in perspective. It all makes a bit more sense to me now. Apparently it *is* okay and natural to let your mind wander. Allow yourself to be distracted. James calls it the “Follow your Energy”-heuristic: go with the flow of what engages your curiosity. Stick with what is fun and fits the natural rhythms of your mind. But in order to be more in control of your learning, combine it with the “Long Leash”-heuristic. Let your mind drift off, but in a controlled manner – keep it on a long leash. Remind yourself that you are on a mission and gently pull on the leash to regain focus again. These are just a couple of examples, but there’s more where that came from. In a way, a lot of the principles or heuristics described in the book reminded me of the young kid trying to work his chaotic way through that wealth of interesting information out there. “anyone whose love of learning is not muzzled or shackled by any institution or authority; whose mind is driven to wander and find its own place in the world”. So, am I a Buccaneer-Scholar? Maybe, I wouldn’t know. I wasn’t a rebel kid at war with the educational system – I actually enjoyed most of my time at school. I am not radically unschooling my kids, as James is doing. I wasn’t a whizz-kid either. I don’t think that’s the point. But I do love to learn new stuff, and preferably in ways that do not really make sense. At least, they didn’t until today. Blame this post on my wandering mind. I’m suffering from a severe case of analogitis. I’m starting to see testing analogies everywhere. The so-called “phantom of Heilbronn” was born. An unknown woman was scattering her DNA all over the place, committing murders, breaking into houses, eating cookies, drinking beer, toting toy guns, she was even shooting up heroin. Profilers could tell that she was quite a busy lady, but she had no identity – the police had absolutely no clue. No Mentalist or CSI Heilbronn coming to the rescue – things were looking bleak. But in March 2009, the case took a new turn. Investigators discovered the very same DNA sequence on the burned body of a male asylum-seeker in France – an anomaly, since the sequence was of a female. 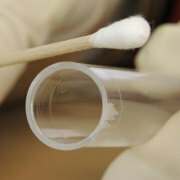 They eventually found out that the phantom serial killer did not actually exist and that the laboratory results were due to contamination of the cotton buds used for DNA probing. They discovered that the cotton swabs were already contaminated before shipping, and that they all came from the same factory. That factory, in turn, employed several Eastern European women who fit the type the DNA was assumed to match. 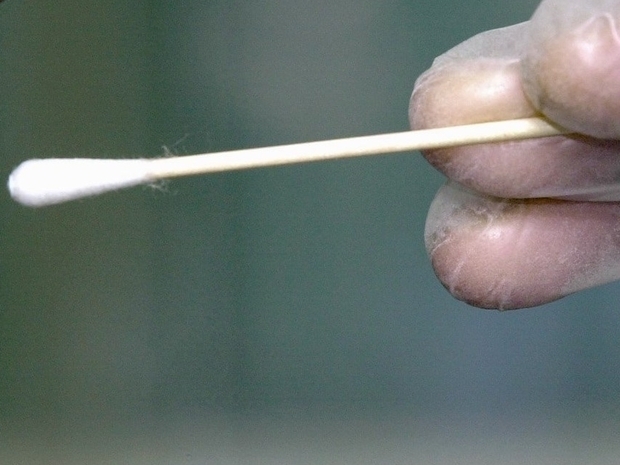 The cotton swabs were not intended for analytical, but only medical use. They were sterile, but not certified for human DNA collection. At this point you are probably wondering what all this has to do with testing. Bear with me a little. Reading the Phantom of Heilbronn story reminded me of a phenomenon I briefly described in my 2007 paper “Software testing, profession of paradoxes?“. When we investigate something, the outcome of our investigations is sometimes influenced by the observation itself. The very act of testing influences its outcome. This axiom is also often referred to as the ‘observer effect’. Paradoxically, software testing is not always considered as the best way toward better quality. Just like in the Phantom of Heilbronn case, the advanced state of the technology might work against us, rather than with us. In 1990, Boris Beizer described the “complexity barrier principle” (1990): software complexity (and therefore that of bugs) grows to the limit of our ability to manage that complexity. 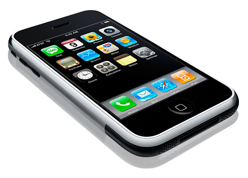 About pinpointing a bug on the iphone and mindfulness. Two months ago my trusted smartphone started failing on me on an intermittent basis. In mid-conversation, people stopped hearing me, resulting in lots of confused hellos on the other end and eventually a whole lot of lost connectons too. At first I was thinking along the lines of a hardware defect. My phone did end up on the ground a couple of times, and I thought that caused my microphone or antenna to be a bit dodgy. I decided to roam the internet in search of an explanation. That resource never failed me so far and I thought that with a little patience and well-chosen search terms I would be able to find some Slovakian or Belarusian forum-guy experiencing exactly the same problem. Well, none of that. I did encounter a lot of nationalities, and some of them I can’t even pronounce, let alone spell correctly. I also met a couple of Mac-savvy gurus with too much time on their hands, but no one recognized my problem or was able to help me. I was puzzled. I had recently upgraded from version 2.2 to 3.0 – did the upgrade go awry? The problems started appearing around that time. Some more googling ensued. I got lost on strange webpages with flashing banners indicating I was visitor nr. 100,000. Another banner told me I had just won the green card lottery for a US visa – without even entering. Miracles do exist. I got heavily distracted by ugly first-generation websites and decided to stop using the internet as my oracle. I started doubting my googling and pinpointing skills, I even started questioning my phoning skills. How hard could it be to find the cause of a problem that is so easy to reproduce? I just needed to call someone or be called and within 5 minutes, people would stop hearing me. One hundred percent reproducible. I was stuck here, so I decided not to think about it for a while to get a fresh angle on the problem. A couple of days later I noticed by chance that the problem didn’t occur when calling hands-free in the car over bluetooth. Wait, did the problem just solve itself, “automagically”? I called from my car again. No problem. I switched off the bluetooth setting and called manually. The problem re-occurred. Bingo! Apparently it had something to with my phone-handling. As far as I knew I didn’t change the way I used my phone, but something was definitely different. I decided to be very conscious while calling, aware of every action I normally perform instinctively. Mindfulness for the iphone, but unfortunately without reaching the path to liberation and enlightenment. It must have looked rather strange to bystanders, but it eventually paid off. By using the phone in a kind of slow-motion way, I noticed that something was wrong with the light detection mechanism. The iphone is designed so that when you put the phone to your ear, the screen goes black to conserve power and to make it insensitive to touching. In this case it was the other way around: when I put the phone to my ears during a call, it went black but not much later turned back to an active, touch-sensitive state – something you normally don’t notice while being on the phone. 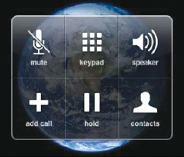 Then I wondered… which options are active while making a call? And which one of these options would cause the problem of people not hearing me anymore, while I could still hear them? I felt a little bit silly after realizing that I had been hitting the mute button with my cheek for two months without noticing. This iphone incident taught me a valuable lesson about testing too. All too often, we do things instinctively, without really thinking. Or we think we are thinking, but our minds are actually on autopilot, and we’re just going through the motions. Becoming very conscious about what you are doing will improve our noticing skills. Noticing is a core testing skill that helps us reveal information about our environment, our actions, ourselves and the product we are testing. When we become more mindful, aware of what we are doing – focus on the current moment – we might become better testers, too. All this learning thanks to a faulty iphone, you just gotta love Apple!